Photo courtesy of Matt Groth. Found at Asian supermarket in Sydney, Australia. The Freezer: (looking pretty confused) Is that some sort of a trick question o sumthn??!!! And the dairy section is giving me the evil eye! oh no, someone kidnapped Mr. Freezer! Or was there a boardroom coup in appliance land, and poor Mr. Freezer is no longer Chairman, and is making a last-ditch attempt to regain his position by petitioning the Frozen foods shareholders? wow! this freezer is out of control! it’s shooting ice at us! CALL THE COPS QUICK! THIS FREEZER HAS FROZEN 10 PEOPLE ALREADY! I have this same picture… the funniest part is that it’s from a grocery store in Australia. that freezer is having WORDAIDS. period. diagnosis final. You should never have fed your feezer all that ice cream. It’s too much sugar for one appliance. At first, we thought it was just a phase it was going through. This is what happens when you do too much ice. Well you better not let it catch you!! help! 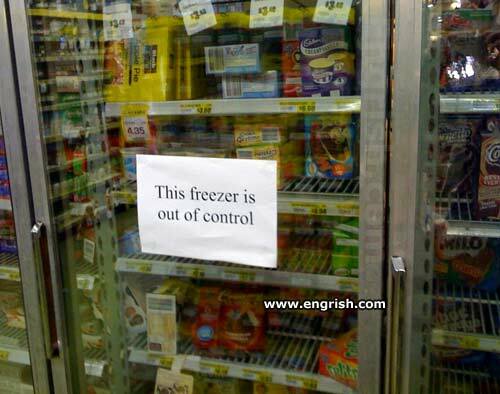 somebody stop that freezer! & our prices are innnnnnnnnnnnssssssssssssaaaaaaaaaaaane! HELP! before someone’s gets iced! i TOLD you you’d void the warranty! but did you listen to me? nooooo! that vanilla ice be tweakin’! look out! he’s makin’ a move towards the slushy machine! Just have Sully ditch it in the Hudson. Ah. Too near to Botany Bay…..
So… i suppose it’s an SCP item?